Multi-nation naval exercise Aman 2019 will begin from Tomorrow. The naval drill from Feb 08 to 12 will be participated by the navies of 46 countries, Commander Pakistan Fleet Vice Admiral Muhammad Amjad Khan Niazi said in a press briefing on Thursday. 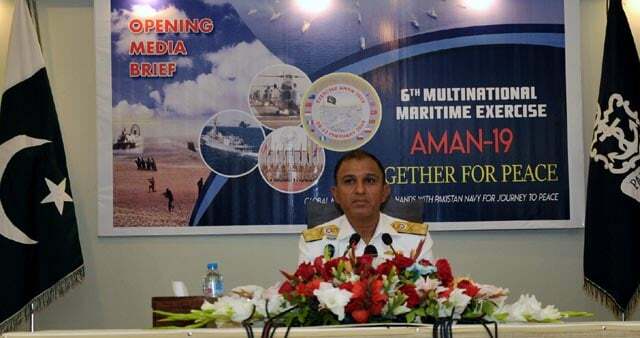 Vice Admiral Amjad Niazi said 46 countries will participate in this Aman 2019 exercise. These countries will send their ships, aircraft, Special Forces and marine troops. In addition, senior naval officers and other delegates will participate as observers. The exercise will be held in two phases from Feb 8-12. The harbour phase of the drill will continue from 08 to 10 February, while the second phase will be held in the sea till Feb 12. The World Maritime Conference will also be held during the Aman naval exercise. The vice admiral said that separate drills will also be held with Turkey, Malaysia and Sri Lanka, while a drill also decided with Oman. Vice Admiral Niazi said Pakistan has signed an agreement with China for four new ships apart of purchasing eight submarines. “We are also purchasing ships from Turkey,” Niazi said. Twelve modern gunboats would also be added to the fleet, the vice admiral said. President Arif Alvi will be the chief guest in Aman 2019 naval exercise, he added. The objectives of the naval exercise include projecting a positive image of Pakistan as a country contributing towards regional peace and stability, consolidating the position of Pakistan Navy in the regional maritime arena, enhancing interoperability with regional and extra regional navies and displaying of united resolve against maritime terrorism and piracy.